Set the planner to use for repairing experience paths inside the ThunderRetrieveRepair planner. If the planner is not set, a default planner is set. Load the header (first row) of the csv file. Move data to string format and put in buffer. Save debug data about overall results since being loaded. Optionally disable the ability to plan from scratch Note: Lightning can still save modified experiences if they are different enough. After setFile() is called, access the generated file path for loading and saving the experience database. Flag indicating whether recalled plans should be used to find solutions. Enabled by default. Flag indicating whether planning from scratch should be used to find solutions. Enabled by default. States data for display to console. Definition at line 86 of file Thunder.h. Definition at line 51 of file Thunder.cpp. Definition at line 499 of file Thunder.cpp. Definition at line 189 of file Thunder.h. Definition at line 186 of file Thunder.h. 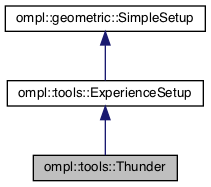 Definition at line 183 of file Thunder.h.